Are you as obsessed with pinning as we are? Pinterest is the social network that lets you share and keep the pictures that matter to you. It’s like an online bulletin board, and it’s completely awesome. If you aren’t already, make sure you’re following our boards. But we’ve got an even sweeter reason to follow us: you could win prizes. 1. Create a board called “The Best Beans,” because the best cooks start with the best beans, right? 2. Pin the image below to your board. 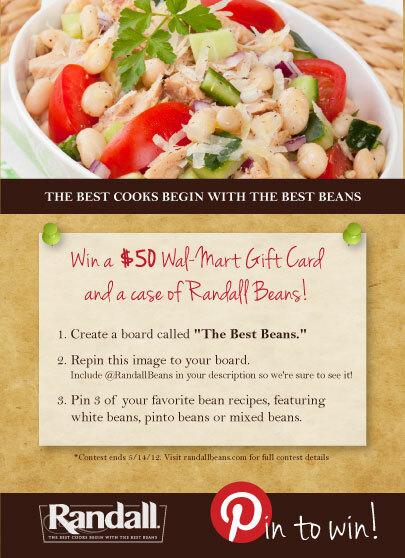 Make sure you include “@Randall Beans” so we know about your entry! 3. Pin at least three of your favorite recipes from anywhere on the web that include either great northern beans, pinto beans or mixed beans. That’s it! We’ll choose a lucky winner at random who will receive a case of Randall Beans Deluxe Beans of their choice and a $50 Wal-Mart gift card. Winner must live in the United States with a valid US mailing address. Must submit your entry no later than May 14, 2012 to win. Get pinning!